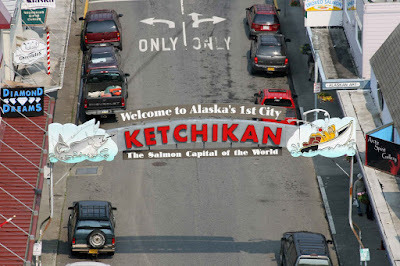 Let’s begin with a little travelin history on Ketchikan, our first port of call. 3. "The Salmon Capital of the World", American settlers opened a salmon cannery in 1886, and by 1936, Ketchikan was one of the largest exporters of salmon in the world, producing 1.5 million cases per year. 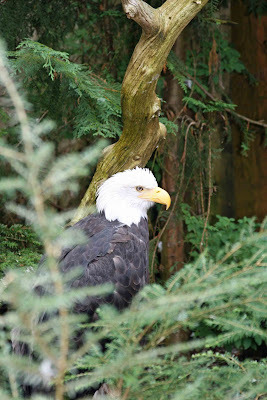 You will see many bald eagles (although some have their hair combed over the top) hanging around one of the local canneries, looking for leftovers. 4. "Totem Town". 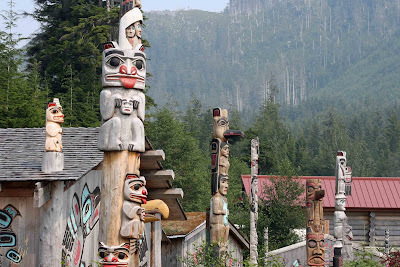 Ketchikan has at least 113 totems .The Totem Heritage Center houses one of the world's largest collection of 19th century totem poles, some up to 140 years old. Totems are generally raised during a potlatch (google that) to depict legends; to honor a deceased family member or to pay homage to some other momentous event. Our tour guide took us through the city of Ketchikan out to Potlatch Park. We walked through the totem park, and to a carving shed where native craftsmen were creating totems that were commissioned for various potlatches, then to a Clan House where a native guide taught on the building of a clan house. We headed to Deer Mountain Salmon Hatchery and Eagle Center and heard the explanation of the life cycle of the Alaskan salmon. The Eagle Center housed a pair of injured bald eagle rescued by the center. On the must see list is the Creek Street Historic District. This infamous, former red-light district, "where fishermen and salmon went up stream to spawn", contains about 20 houses built on wood pilings over Ketchikan Creek. In its heyday in the 1920's and 1930's, loggers and fishermen came to visit the Creek Street bordellos (of which there were more than 30) and kept the "sporting women" (as they preferred to call themselves) in business. The most famous of these proprietors was Big Dolly Arthur, AKA Thelma Copeland. Dolly's former place of business is now a museum, and open for tours. OK, this is all very dry so I’m gonna sweeten the pot. Takes notes, print off the travel notes, whatever…’cause there’s a prize at the end.